As the only daughter of renowned artist and painter Henry Sugimoto, Madeleine Sugimoto has the immense responsibility of caring for the legacy of hundreds of pieces he created. “Whatever work my father had here in the city [New York], I donated all of the artwork to the Japanese American National Museum. 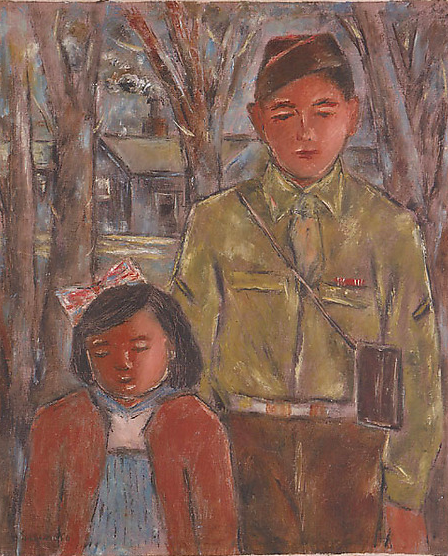 It was not only oil on canvas, but he did watercolors and he did block printing.” Madeline donated three large canvas murals to the Smithsonian Museum of American History and her father’s work is on display at Hendrix College in Arkansas, the state where the Sugimoto family was held in Rohwer during the war. What do you remember when Pearl Harbor happened? I remember that after Pearl Harbor, my father was in a young men’s group in Hanford that was a mix of Caucasians and Japanese Americans. And one of his friends said to him, “I think you have to be careful.” Because my father had taught Japanese language on the weekend to people in the community and young students. And this friend knew that and said, “You know, because you taught Japanese language, the FBI may be after you.” With that, my father prepared a small suitcase in which he put in some of his daily needs and was prepared because he thought that perhaps the FBI would come after him. It was reinforced because one of my grandfather’s friends came over to say that his friends had been taken away by the FBI. Of course, we all were under curfew so that every night by 9:00 pm we all had to be in our homes. So those were some of the things I remember shortly after the bombing. Did the FBI ever come for your father? No, fortunately not. But it was always a feeling that something might happen. I was certainly not aware as a child that was happening. I only learned of it after. No, I was an only child. But as an only child I would say, I think there was no worry or fear on my part. I think that’s probably true of children in general. If you’re with your parents, you don’t really fear or have anxiety as long as you’re not separated from them, and so I think that’s why there was nothing in me that I could remember as being worrisome as a child. I’ve gotten that sense from other people I’ve spoken to who were children in camp. That it seemed to be a happier time because it was like a big gathering. I read in one of your interviews that there was a moment you thought everyone was at a picnic. Could you retell that? What happened was we were sitting at those wooden picnic tables with the benches. And we were having a meal and there were the other people from our community sitting around the other tables. And when we finished the meal I said, “Oh, when are we going to be going home?” And that’s when my parents said we’re not going home, this is where we have to stay. And so that’s the time when I realized it wasn’t really a picnic, as I always thought. That’s when my mother or father said we weren’t going to be going home, that where we were is where we’re going to stay. I think it’s interesting that’s the way you remember it. The perspective is so different as an adult. Do you remember your parents being worried or feeling like they were uncertain about what was going to happen? I think that as a child, I was protected because my parents and their friends and my grandparents never really spoke about anything in regard to what was happening. So later on as I grew older and I talked with them, then I found out how fearful they were and worried because they didn’t know what was going to happen next. And it’s only after I got older that I realized the anxiety and terrible experience they had with being evacuated into an internment camp. Were your parents open about talking about the camps or were they quiet about it? No they were very, very open about it. After we left the camp and went to New York City, we came directly from Arkansas to New York City. My father, as an artist, was continuing to paint. And he was continuing to put images on canvas of experiences in camp and because of that — and hearing what he said talking to my mother or to friends — that I realized what happened. So there are images my father has painted of camp life that help me to remember. But I can remember specifically as a child, that I had three playmates and we decided we would go exploring. And that’s when we went outside of the barbed wire fences and into the swampland in Arkansas. So as a child, I would say that it was a happy time because I was doing what I probably would do if I were not in camp. And remembering the fact that there was a Boy Scout troop and a Girl Scout troop and I was only six, so I joined the Brownie scouts. So there were different things that I remember as a child, that was probably very similar to what it would be like if I was outside of camp. Your life wasn’t as interrupted because of your age. But do you feel that your father was interrupted, career-wise? Well, I believe that he was able to do sketching and different kinds of painting in camp. And how he did that was when we first went into the camps, all our property that we carried with us in the camp was wrapped in those raw canvas. So my father, once we went into the barracks, he went around the area and said to the neighbors, “If you’re going to throw away that raw canvas would you please give it to me?” So he even used the raw canvas for as a source for his painting. My mother and he had both graduated college, and my mother taught first grade and my father taught high school art. They were certified by the state of Arkansas so that they could be considered teachers in the school system in the camp. And my father continued to do what he was able to do, which was be an art teacher and be able to do the painting and sketching that he wanted to do during the free time. So I believe it was close to how he actually would be living as an artist if he was outside the camp. Was your mother an artist too? No, my mother didn’t want to do any art. She enjoyed working with children and that’s why she became a first grade teacher in the camps. She didn’t have any talent nor even try to do anything with art. She just met my father in Hanford when she was in high school, and my father and she and his parents lived nearby so that’s how they got to know each other. So your parents were Nisei? My mother was born in Hanford but my father was born in Wakayama. Then he came to the United States after both of his parents came to the United States and were living in Venice, California. So he was not an American citizen until it was permitted later on. I did when I was younger but I no longer speak it. One of the things is that my father being from Japan felt more comfortable speaking Japanese, so my mother and he spoke Japanese and with that I understood a little bit but really never spoke Japanese except as a child. Once we left and went into camp we all communicated in English except for my mother and father who continued to speak Japanese to each other. And you were in Jerome, correct? Yes it was first Jerome and when Jerome closed, we were in Rohwer. From there we came to New York City. Was New York where he wanted to go regardless? Yes that was his choice. When the government said we could leave the camps and go wherever we wanted to, my mother and father must’ve talked about it and because my father was an artist and had come to New York earlier, he had experienced the enjoyment and the activities of being an artist. And so my mother agreed. He produced an incredible amount of work in the camps. There were two different paintings that I wanted to ask you about. The first is called Final Decision. It’s a Japanese American solider looking at a picture of his parents with an American flag on the wall. Can you describe what that’s about? Well the fact is that being in camp, many of the young fellows wanted to join the army which is ironic. And so I think in that, my father tried to capture the sense of a young man wanting to join the army — or having joined the army and still he was in camp — but he joined the United States army to become a serviceman. So I think there’s an irony in that. But it was not something that was unusual because that did happen. There were young men who wanted to become U.S. soldiers in the army. It’s so powerful. I think the other painting that speaks to a similar theme is called Am I An American Citizen? And it’s two men who are out chopping wood and one man has his head in his hands and the other man is consoling him. How does this also speak to that conflict of belonging? I believe there was confusion and ambivalence about being in a camp behind barbed wire yet at the same time, still wanting to serve in the army because you were an American citizen. I think that’s the kind of sense that was also in the air and my father tried to capture it, with images of people confused and not knowing. In that way your father became a journalist to chronicle all the conflict people were feeling. Were people interested in the fact that he was producing work? Did people want him to paint certain representations? I never heard my father and mother speaking about it. My sense is that my father was trying to capture images of the experiences in camp but it was not to be “for”or “against” the government. It was his sense of being an artist and trying to capture in images, the emotional environment in which people were living. But nobody ever asked him or said you should do it this way or that way. My father, I think, felt very comfortable to do what he felt he wanted to express, not because somebody or people asked him to do it. It was his own feelings that he was expressing. I don’t think he felt swayed one way or another. As an artist he was expressing what he felt in terms of his own experience or what he saw and then putting it on canvas, rather than having any political notion about what was being put on canvas as such. Which is what is so powerful about having these pieces of work. The paintings give a very clear depiction of what was going on. And you had an uncle who was in the U.S. army, correct? Yes, Uncle Ralph. That’s my father’s third, there were four brothers in his family, and he was one of four. And so Uncle Ralph is one of his younger brothers and he was in the service. And was he the only one out of the brothers that served in the military? Yes that’s correct. Because the others weren’t of the age where they would be put into service. My father being the oldest, and Uncle Ralph being younger. Can you sum up some of what he went through in the army? Well, he was in that segregated 442nd Infantry Battalion and he talked about being in Sicily and Italy. I believe in that sense it was trying to keep the Japanese American service members away from Japan and the Asian area because of the conflict it would have between being a Japanese American and being a service member and being in the place where they’re fighting against their own people — in a sense — of Japan. And my uncle, I think he was the one who talked about having shrapnel that injured him. So that he talked about it long about after the war and the fact that he was in the fighting in Sicily and Italy. When you relocated to New York, did you move with other Japanese Americans that were going as a group or were you one of the very few families? Well it was because my father, having had a really wonderful experience in New York as a younger man, that brought us to New York. It was really a family decision rather than any kind of a community decision. But certainly there were others who came later on who were in camps. But it wasn’t a decision. He wanted to come to New York. Do you have a story or image in your mind that you think of when you think of your time in the camps? Well for me, it was really a happy time as a child because we lived very much as children, going to school and having playmates and doing things that we probably would’ve done outside of the camp. And so for me, the camp experience was not a sad or typical one. It’s only that I know having learned later on coming to New York where different Japanese Americans got together and would talk about things and also my family saying how difficult it was, the uncertainty of the future that I learned about it. But as a child it was always something that was a happy time. I only know through what I read that you worked in health care, but what did you do professionally? Yes well, I became a nurse. And then after I worked at Cornell New York Hospital and graduated from Cornell New York Hospital School of Nursing and worked there. And as I continued to do my work, I enjoyed the contact I had on as a staff nurse with some of the students who would come to the unit from outside the hospital for their clinical experience and I enjoyed it very much. But I believed that if I was going to work with students in that capacity then I would need more of an education. So I enrolled in teacher’s college and got my two Masters in Education and Curriculum and I continued to teach at the School of Nursing. I identify myself more as being a nurse educator. In this current political moment that we’re in, what do you feel we need to really be aware of? I think the experience of us, the Japanese Americans, comes alive more now when you think about the Muslim population. And the fact that after 9/11, the Muslims [were] being looked upon as very suspicious and people that we couldn’t trust. And I know that the feeling that when they said “round them up,” was an expression that was used to round us up to put us into internment camps brings back memories of people that were perfectly innocent and good citizens and people living in the community contributing. I think there’s much more of a sympathy for them in terms of what they experience because we were also separated and put into a specific category of people that couldn’t be trusted at one time, so it’s really to support the Muslims as a responsible people who live and work as equally responsible and should be looked upon as citizens, and people to be accepted and welcomed and part of the regular community.